Yesterday, we saw a small grey rat walking in brisk circles on the sidewalk. "A rat!" cackled a wheelchair-bound woman with large, pink bare hands and feet, and cat-lady hair. "Someone must have poisoned it. I wish I had something to hit it in the head with." 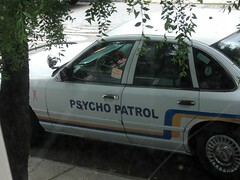 The Psycho Patrol was parked outside our house all weekend. Go figure.